Are short like me? If so, I am super excited to show you how to wear a maxi dress if you are short. Even if you are short, you should get to enjoy the benefits of wear a maxi dress. Who doesn’t want the comfort and chicness only a maxi dress can give you? The obvious and oh so annoying way to get the perfect length for your maxi dress is to hem it to the ideal length. The best length for a maxi skirt is one that falls between your ankle and the top of your toes. The best thing to do is to bring it into the tailor with the shoes you are going to wear with it. You really need to talk to show your tailor how to hem a maxi dress the way you like it. I live in flats these days, so I bring in my pretty sandals. The cool part of hemming a long maxi dress is that you can ask your tailor to save the fabric. Make sure they write it down, because they will forget to save it. You could use the extra material to make a headband or even a cute matching fabric covered bangle. Here is DIY tutorial that I did a few years ago on how to make your own fabric covered bangle.
. I took photos of how I hemmed my shorts here. I like to do this for skirts that I want to be able to wear with flats and heels. With most maxi dresses that are too long, you can put a belt around your waist and pull the top fabric up to blouse it over the belt a bit thereby pulling up the hem at the bottom. As a short woman, I love a reliable platform and cushioned wedge. I recently found a replacement for my favorite platforms. I am happy to say that they are easy to walk in and don’t hurt your feet. They also happen to be incredibly chic and on trend with embroidered rose print on the heel. Check out how I wore them a few weeks ago when I wrote about Libby Edelman’s new line for JCPenney. You can wear them with jeans or even under this red infinity dress. This is my go-to spot to find dresses for short women like me. They have an extensive petite section that will help you find everything from eveningwear to wear to a gala to a fun weekend dress. I also found this merlot boho dress that did not need to be hemmed on a site called Top Tier Style. If you would like to purchase your use the coupon code BLOG15 for 15% OFF everything in their store! When shopping online, keep your measurements on hand. I have a note in my phone with every possible measurement that I have on my body. It makes shopping so much easier. Try vintage maxi dresses out. Women were more petite in the 60s and 70s. For example, my mother’s 70s vintage maxi dresses that she wore with platforms are the perfect length for me to wear with flats. I am 4 inches taller than her at 5’3, ” and she is 4’11” and my grandmother was only 4’10”. Lots of power packed into this petite women. I learned early on; height means nothing, it is your attitude that matters. The best way to choose the right neckline for a maxi dress is to start with the neckline you feel most confident and comfortable in. I always prefer a v-neck over a scoop neck. I think that it is the most flatter for most body types. Naturally, not all v-neck dresses are created equal some are far too low for some occasions or some decolletage. You want to choose necklines that will draw the eyes up as the skin revealed on top helps balance the amount you are covering on the bottom. This look is from a Stitch Fix box that I got last year. It has stretchy fabric on top and flowy fabric on top. Now that we have discussed finding the right maxi dress for a short woman let’s talk about how to wear a maxi dress once you have seen the right one. As a petite woman, you want to choose a purse that does not overwhelm your frame. This works for accessorizing a maxi dress for a small woman. Crossbody bags always seem to look great with maxi dresses. Cocktails rings are a fun choice to pair with an elegant maxi dress, or you can take a subtle bohemian approach with a set of stacked rings. I always love a good hat. To me, a cute hat just naturally go with maxi dresses. On the weekend, I wish to be as comfortable as possible. I like a flowy maxi dress and a lovely hat to keep me protected from the sun. This outfit is from Fourth of July. Slightly festive and fun at the same time. When wearing a solid color maxi dress, I like to wear a large number of bracelets to bring some color to the look. Bracelets are versatile and easily stacked. You can start with a bold cuff or layered bangle bracelets to add character to a maxi dress outfit. You can continue elongating your body with the help of a long necklace. Short necklaces bring the eye close to your face. You want to draw the eye to how long you look in your maxi dress. Long necklaces help continue the verticle line. I like to wear a brightly colored long earring to frame my face when I have my hair down. It is my new favorite accessory trick. I discovered it a few weeks ago when I was editing these pineapple jumpsuit outfit photos. Please note: Occasionally, we use affiliate links on our site. This in no way affects our editorial decision-making. Feel free to make purchases through the links contained in this post. It costs you nothing extra to do so and we greatly appreciate it. Thanks! 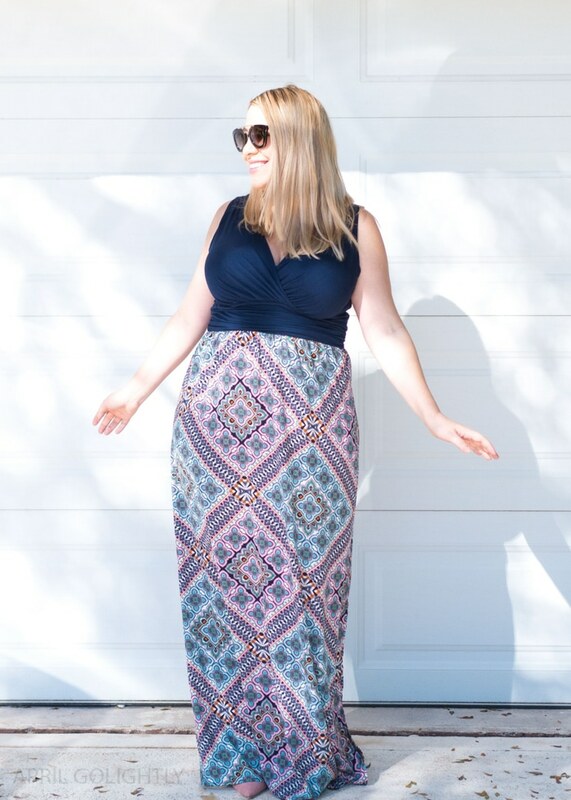 Do you have any other tips on how to wear a maxi dress if you are short?